This land resembles no other place. Sardinia is something else. Enchanting spaces and distances to travel—nothing finished, nothing definitive. It is like freedom itself. So far today I haven’t left the premises. 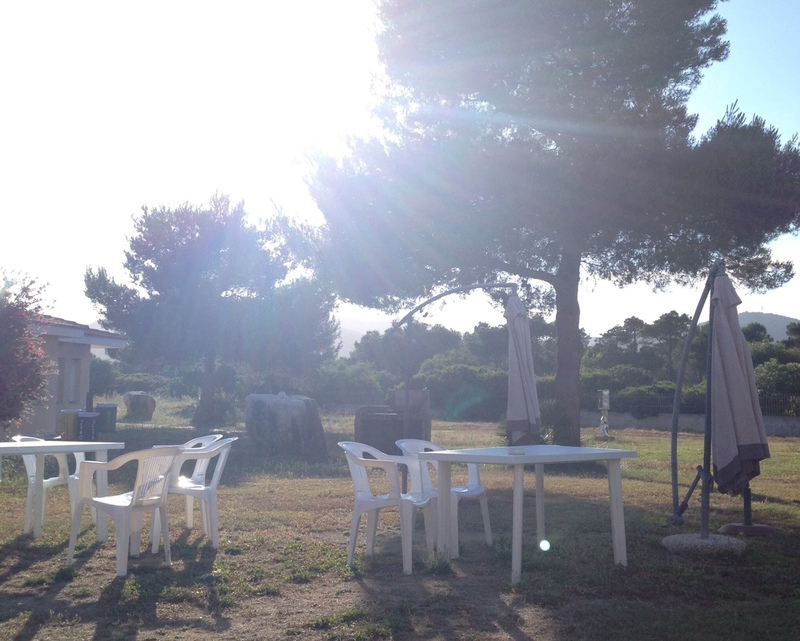 Hostel Alghero is a series of small bungalows with a central espresso/wine/Fanta bar and a tiled patio. I sit in the same white plastic chairs that adorn patios in Vancouver. I wonder which countries, if any, don’t have these chairs. Inside, the only noise is the TV that plays pre-MTV-era music videos: Queen and Stevie Wonder and David Bowie. There’s a dusty pool table pushed against the wall, some dorm-style tables, a chess board with no apparent pieces. Siesta is running long today. I planned to get to the beach but a lingering mirto headache has slowed my progress. Mirto is a digestivo—an after dinner liqueur—made from myrtle berries. It tastes bracingly medicinal, like high-end cough syrup—with the same consistency. The Sards serve it straight from the freezer. It’s weird at first, but it grows on you quickly, especially when a glass appears without you asking or really even noticing how it arrived. It seems the line between the recommended amount of mirto and an excessive amount mirto is a fine one. I sit on the patio and watch people come and go. And I write. It’s hot still at a quarter to six, but the breeze is stiff and cool. I’m sharing the hostel with my friend Kirsten’s geology field school and as the students filter in from the airport, their loud American voices seem to hang in the air. Some have already been down to the beach or to see the cow that’s slowly rotating on a spit in downtown Fertilia—an area that’s exactly two blocks long and one street wide. They put up the cow last night as we walked home from dinner. A veal roast, they said, but this beast appears fully grown. We watched them build up the fire from a heaping mound of logs in the street. The musculature wrapping around the bones was deep red and white, as vivid as any classroom anatomy poster. But this cow is spread eagle and pierced sternum to pelvis with a ten-foot steel pole. One end of the spit has been slung to a crank with a bicycle chain. The camp faculty have talked me into giving a lecture on academic writing and in exchange have plied me with salami and Vermentino. I am certain I’m getting the better end of the deal. It’s such a pleasure to chat about teaching over smoked ricotta and late night mirto. It feels, in fact, like I’ve fallen into someone else’s rhythm, a space that doesn’t, or shouldn’t, exist. Still, it suits me to settle in somewhere.